The House chairman of the General Assembly’s tax-writing panel announced Tuesday he will propose adding 4 cents per gallon to Connecticut’s gasoline tax to avert a crisis in the transportation program. 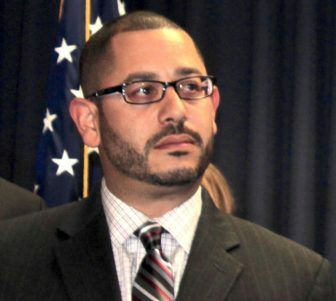 Rep. Jason Rojas, D-East Hartford, said this proposal would not eliminate the need for a more in-depth debate to address Connecticut’s transportation financing needs for decades to come. But unless some action is taken during the regular 2018 session — which begins Feb. 7 — Rojas said he’s convinced capital projects will stall, rail and bus fares will rise, and key transit services will be canceled. Rojas, who posted his plans Tuesday on Twitter, then discussed them in an interview with The Mirror. The East Hartford lawmaker echoed concerns raised over the past two months by Gov. Dannel P. Malloy, who has alerted everyone from Wall Street investors to business leaders to state legislators about the need for immediate action. The Special Transportation Fund, which holds about $1.51 billion this fiscal year and represents about 7 percent of the overall budget, is in crisis. The administration says the existing transportation program is headed for a series of annual deficits starting with the fiscal year that begins July 1, and would reach insolvency by mid-2020. Meanwhile, debt costs on transportation bonds –involving both outstanding debt and anticipated borrowing in the next few years — are surging rapidly as Connecticut tries to reverse decades of deferred maintenance and other infrastructure investment. Rojas said he believes raising the retail gasoline tax, which currently stands at a flat 25-cents-per-gallon, is the most transparent way to address the transportation fund’s needs. Connecticut also imposes a wholesale levy on gasoline when it is delivered to stations. That cost typically then is built into the price charged to motorists. Rojas said he also anticipates support from Connecticut’s business community, which includes many vocal advocates for greater transportation investment. The head of the Connecticut Construction Industry Association, Don Shubert, recently warned a major contraction in the state’s transportation program could cause hard-to-reverse damage to a construction industry already in retreat. Earlier this month Malloy outlined nearly 400 capital projects worth $4.3 billion that would be suspended over the next five years because of inadequate funding for transportation. “Considering the governor’s comments, and all indications from the state’s presentation to the (Wall Street) credit rating agencies, it’s clear that the revenues flowing into the Special Transportation Fund are not sufficient,” Shubert said Tuesday. The alternatives, both project and service cutbacks, “are in nobody’s best interest right now,” Shubert said, adding he believes many businesses would back Rojas’ proposed tax hike. Rojas added he is willing to discuss options for phasing in the tax increase, but insists something needs to be done now — regardless of the fact that 2018 is a state election year and legislators traditionally steer clear of tax increases during those times.